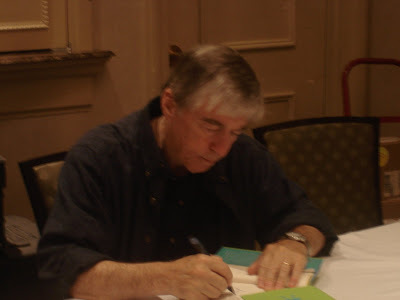 Just Thinking....: NEIBA....the thrills continue with Jerry Spinelli! NEIBA....the thrills continue with Jerry Spinelli! Beloved author, Jerry Spinelli, signs copies of his latest book Love,Stargirl! I had the good fortune to have had an hour of Jerry's time to talk about his career, family (including 16 grandchildren! ), upcoming projects and the magic of Stargirl! I will be transcribing our conversation and it will be printed in this blog "soon!"